Unlike most of her peers, however, Kim was one of the few to turn her stress relief experimentation into a $2.5-million-funded business. The Forbes 30 Under 30 Entrepreneur and Stanford dropout recently raised a new round of funding from top investors – including Drew Houston, founder of Dropbox – for Simple Habit, a startup she describes as “the Spotify for meditation”. But First, What is Mindfulness, and Why Does it Matter to You? Pop quiz: what do hedge fund founder Ray Dalio, Salesforce CEO Marc Benioff and TV personality Oprah Winfrey have in common? Answer: Besides all having over 9 figures in their net worths, they all practice some form of mindfulness or transcendental meditation. As a restless college graduate, I can personally attest to the calming effects that meditation can bring to a racing mind. It’s simple: 5 to 10 minutes of closing my eyes and following simple instructions through a mobile app in the morning (e.g. taking deep breaths, being aware of my own thoughts) led me to better concentration and more clarity throughout the day. When you’re in an environment where both are in high demand, this goes a long way. But don’t take my word for it. Best-selling author Tim Ferris, who interviewed more than 200 executives and leaders including the Governator himself, Arnold Schwarzenegger, noted that 80% of his interviewees engaged in “some form of guided mindfulness practice”. In fact, mindfulness has been around long before it caught the interest of Wall Streeters and Silicon Valley executives. Modern Western practitioners and teachers of mindfulness, for the most part, learned about mindfulness from the Buddhist and Hindu traditions. A big part of how the predominantly Eastern practice spread to the West is Jon Kabat-Zinn, Professor of Medicine Emeritus at the University of Massachusetts Medical School. Kabat-Zinn created a stress reduction program known as mindfulness-based-stress-reduction (MBSR), a secular program used by doctors and patients to counter the effects of anxiety, depression and stress. The program has helped what many might have disregarded as a “hippie fad” to gain increasing traction in the medical and scientific community, which might explain its increasing credibility. Recent studies have even shown that meditating can have a physical effect on your body: one study found that grey matter concentrations in brain regions related to your emotions and learning might increase in density following MBSR. So, with the increasing prominence about the benefits of guided meditation, one question you might have is: how can I get started? Yunha Kim believes she has the answer. Kim’s latest company, Simple Habit, is a mobile and a web application that aggregates more than 1,000 guided meditation sessions, tailored to your busy life. The sessions are recorded by some of the world’s top mindfulness teachers and target different potentially stressful aspects of your life, including everything from commuting to work, public speaking, dealing with coworkers, to preparing for a date. The product itself features a simple interface for you to pick the 5-10 minute session that best suits your need. Once in the app, you can then pick from a wide assortment of descriptions that best fit your needs – from the specific (“For Professionals”, “For Students”, “Vacation & Travel”) to the generic (“Healthy Relationships & Family”, “Energize & Empower”, and “Overcoming Challenges”). The level of personalization on the app can be traced back to the origins of Simple Habit, which started as Kim’s personal experimentation with meditation. Kim started the venture as a passion project during her time at Stanford, which she dropped out from to focus on the venture full-time. 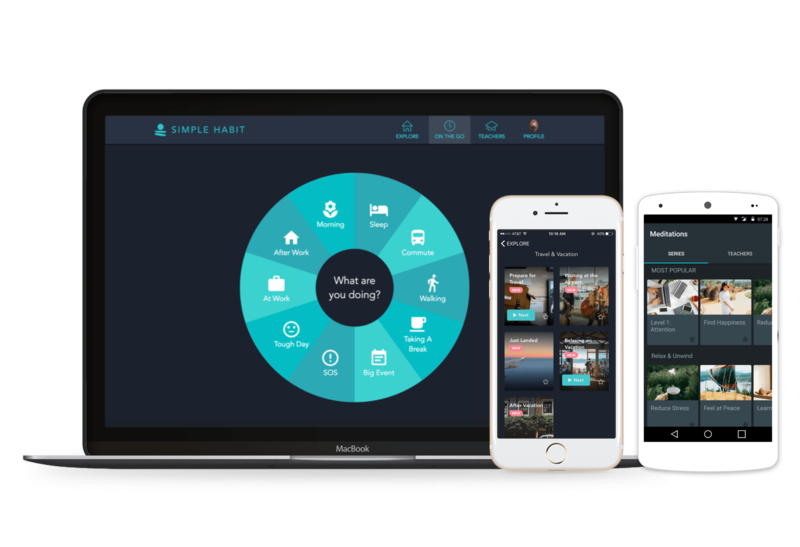 Since then, Simple Habit has graduated from the selective startup accelerator Y Combinator, and is announcing a $2.5 million funding round led by investors like New Enterprise Associates (NEA) and the founders of Dropbox and Gusto. The new round of funding is intended to help the Simple Habit team expand in San Francisco. There are many existing meditation applications out there (e.g Headspace, which charges $7.92/month for 12 months, or $12.99/month for a monthly subscription for premium content), but few that looks like Simple Habit yet. Kim assembled her “army of teachers” with the help of Kelly Boys, former program director of Search Inside Yourself (born out of Google). Through her and other connections, Simple Habit built a platform that boasts of over 50 thought leaders and teachers in the space. To make sure only quality content goes onto the platform, teachers have to go through a rigorous vetting process when they submit their material to Simple Habit. The company will interview the teachers, review the audio integrity and content quality of each session, and even track completion rates to see if lessons the teachers deliver are bringing any engagement. The Simple Habit app also provides its premium services for a fee ($7.99/month for 12 months, or $9.99/month for a monthly subscription). Kim mentioned that while the majority of Simple Habit’s power users right now are smart, ambitious and busy people (ranging from college students, to lawyers, bankers and the tech crowd), she sees a broader application for her company. “New moms who are experiencing new stressors, cancer patients with anxiety issues, these are all people with everyday stressors that we want to help,” she said. Previous Post Harlem: New York’s Next Silicon Alley?